What if you and your neighbors decided one day to turn your street into grassed- over park, replete with pony rides, an oompah band and vegetable gardens? When presented with such a possibility, most would laugh derisively or mention something along the lines of, ‘Have you lost your ever-loving mind?!’. In many respects, this is a completely reasonable reaction. Imagining the possible benefits of greening a street, prioritizing public life over cars through design or even conceptualizing how such a space might look or function is absurdly hard for anyone. For a car-centric culture, greening a street is such a radically different idea that many will reject it out of hand not because they don’t like it but because it is so absolutely foreign it is impossible to evaluate; it doesn’t match any of our traditional reference points for judging whether something is good or bad, whether it works or doesn’t work. Companies run into this phenomenon all the time when they introduce ground breaking products such as the Aeron Chair, the Segway (not a fan) or film replacing-flash memory cards for cameras. Thanks to Malcolm Gladwell, it is now well known that Herman Miller’s best selling Aeron Chair initially tested abysmally with focus groups because it looked nothing like the stuffed leather predecessors that users typically associated with comfort, power and prestige. Of course, over time through direct use, the Dot Com boom and people acclimating to its form through thoughtful product placement, the Aeron completely transcended the initial negative feedback and has now completely re-framed people’s conception of the office chair. Unfortunately, it’s harder to establish new reference points for street design. At the very least, it is truly difficult to take a street for a ‘test drive’, to walk through it and give it a try until changes actually get built. When the Methleys, a neighborhood in Leeds, England decided to permanently redesign their streets to support the social life of the community rather than simply be corridors of movement (in England these are called home zones) it wasn’t because they had suddenly developed a case of deep seated home zone envy. Much like the Aeron, there were few if any precedents for this sort of transformation in England at that time. Instead, driven by a desire to make their streets more child and family friendly, they ‘found’ their solution through testing and experimentation. Working with the creative think-tank, Heads Together, they began to host ‘On The Street’ activities that both explored and tested the limits of how the community was interested in using these spaces, with activities ranging from street aerobics to dog shows to an outdoor cinema. Although seeing Richard Simmons leading group aerobics in your street is undoubtedly impactful (in so very many ways), the truly transformative event was the temporary sodding of one of the Methley’s main streets for a weekend-long festival in 1996 that did in fact include an oompah band and sod watering races. 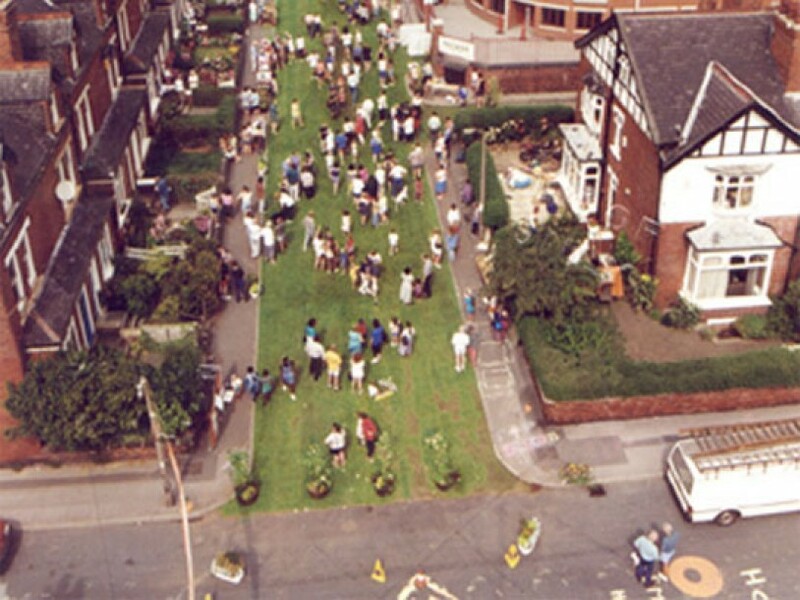 Masterfully programmed and publicized, turning this street into a field not only allowed the community to fully explore radically different uses of that space but the comprehensive media coverage helped the entire country share in their experience, eventually leading to the creation of a government supported home zone movement in the United Kingdom. Visiting Methleys’ community website, it immediately becomes apparent that they are a truly unique group of people and that the tight knit nature of their community undoubtedly created an unusually fertile ground for exploration. However, the tools they used to find and create their particular definition of a livable street are more widespread than you might think. Increasingly, short term events such as Ciclovia,the Aeolian Ride, Big Urban Game, Park(ing)Day, Manhattan Mega-Putt and Austin’s own Foam Sword Friday (pictured) are (intentionally or not) challenging both the participants and observers’ understandings of how a street and its surroundings might be used. These activities are particularly powerful and useful, especially around polarizing issues, because many of them are inherently absurd, often disarming both the participant and the onlooker. Absurdity is therefore an important tool for change in places like Austin because it helps turn off the anger typically associated with such hot button issues like street use and creating new opportunities for communication, and understanding. Absurdity can also completely re-frame possibility, allowing one to see connections and opportunities that might have otherwise been elusive. The New York Times published an article yesterday, that will surprise few teachers or creative types, documenting nascent research establishing connections between improved pattern recognition and nonsense. Can we actually make better cities if we create design processes that are fun and at times ridiculous? Similarly, the temporary installations and DIY street design kits of groups such as SUSTRANS, Space Hijackers and City Repair allow a neighborhood’s residents to actively design and test changes to their street scape, exploring possibilities that they along with the designers or engineers may have never otherwise imagined. The temporal nature of the explorations has the added benefit of ratcheting down the tensions typically associated with public design processes, creating a climate more conducive to empathy and exploring opportunity. Simultaneously because the activity is meaningful and visible, if done well, these processes build social capital, ownership and community pride. All of this points to the fact that there are great opportunities for Austin to evolve its street culture and thereby the design of these streets to meet the needs of the 21st century by enhancing, and celebrating its weirdest and most wonderful sensibilities. So, what are you going to do to Make Austin’s Streets Weirder? Over the past couple of days, the New York Times has published two (one of them is a bit old hat) interesting articles on the above mentioned topics. Tags: austin, make austin weirder, temporary land use policy, The Weekly What If?